If it is true that the cross is of central importance to biblical Christianity, it seems that it is essential for Christians to have some understanding of its meaning in biblical terms. That would be true in any generation, but it's particularly necessary in this one. I doubt there has been a period in the two thousand years of Christian history when the significance, the centrality, and even the necessity of the cross have been more controversial than now. There have been other periods in church history when theologies emerged that regarded the cross of Jesus Christ as an unnecessary event, but never before in Christian history has the need for an atonement been as widely challenged as it is today. People tell me that they are not Christians, not so much because they have never been convinced of the truth claims of Christianity, but because they have never been convinced of the need for what the Bible teaches. How many times have you heard people say, "That may be true, but I personally don't feel the need for Jesus," or "I don't need the church," or "I don't need Christianity"? When people say something like this to me, I try to steer the conversation to the question of the truth of Christianity. I believe that if we can convince people of the truth of the identity of Christ and the truth of the work He accomplished, it will become instantly apparent to them that they need it. On one occasion, while I was waiting for my wife, Vesta, in a shopping mall, I noticed a bookstore and I stepped inside. There were counters and counters of books in that store, with the various categories marked prominently: fiction, nonfiction, business, sports, self-improvement, marriage, children's stories, and so on. In the very back of the store was the religion section, and it consisted of only four shelves, making it one of the smallest segments in the store. The material on those racks was not what would be called mainstream, orthodox, classical Christianity. I wondered, "Why does this store sell fiction and self-improvement, but place no premium on the content of biblical truth as part of its program?" I realized the store wasn't there as a ministry. It was there for business, to make a profit. So I assumed the reason there were no solid Christian books was that there weren't a lot of people asking, "Where can I find a book that will teach me about the depths and the riches of the atonement of Christ?" Even when we go to a Christian bookstore, we find little evidence that people are seeking in-depth understanding of something as central as the atonement. I thought about these things, and I came to the conclusion that people are not concerned about an atonement. They are basically convinced they have no need for it. They aren't asking: "How can I be reconciled to God? How can I escape the judgment of God?" If anything has been lost from our culture, it is the idea that human beings are privately, personally, individually, ultimately, inexorably accountable to God for their lives. If everybody in the world woke up and said, "Someday I have to stand before my Maker and give an account for every word I've ever spoken, every deed I've ever done, every thought I've ever thought, and every task I've failed to do," several things could happen. They could say, "I'm accountable, but isn't it great that the One to Whom and before Whom I am accountable isn't concerned about the kind of life I lead, because He understands that boys will be boys and that girls will be girls." In that case, nothing would change. But if people understood that there is a holy God and that sin is an offense against that holy God, they would break down the doors of our churches and ask, "What must I do to be saved?" The statement that the cross was an absolutely necessary prerequisite for redemption immediately raises the "Why?" question. The answer lies, as it has even since the time of Augustine and Pelagius, with our understanding of the nature of the character of God and the nature of sin. If we are defective in understanding the character of God or understanding the nature of sin, it is inevitable that we will come to the conclusion that an atonement was not necessary. Dr. R.C. Sproul is founder and president of Ligonier Ministries, and the author of The Truth of the Cross. For more than thirty years, Dr. R.C. Sproul has thoroughly and concisely analyzed weighty theological, philosophical, and biblical topics in books, seminars and "Right Now Counts Forever," his monthly column in Ligonier Ministries' Table Talk magazine. 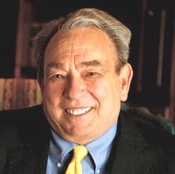 Listen to Dr. Sproul now at OnePlace.com. ©Reformation Trust, 2007. Used with permission.